Grilled Wine and Cheese Pizza has a white wine sauce topped with chicken, mozzarella and parmesan cheeses. Arugula and tomatoes are piled on after grilling. Melt butter in a medium saucepan over medium heat. Add shallot, salt and pepper. Cook, stirring occasionally, until softened and translucent, about 5 minutes. Add garlic, stir, and cook for 1 minute. Add flour and cook for 1 to 2 minutes stirring occasionally. Slowly pour in wine, whisking while pouring. Cook for 5 minutes, stirring occasionally. Slowly pour in milk, whisking while pouring. Bring to a simmer and cook until it thickens, about 5 minutes. Add parmesan cheese and whisk to combine and until cheese has melted. Remove from heat. Heat a grill to medium high (about 450° to 500°F). Roll out dough into a circular or rectangular shape. Place dough on a pizza peel (sprinkle pizza peel first with cornmeal for easier sliding of dough). Slide the dough from the pizza peel onto the grill grates. Cover and grill for about 2 minutes, until bottom has lightly browned. Brush uncooked side of dough with olive oil. Spread a thin layer of sauce over dough. Top with chicken, mozzarella cheese, and parmesan cheese. Return pizza to the grill. Cover and cook about 2 to 3 minutes, until cheese has melted and bottom of crust has browned. 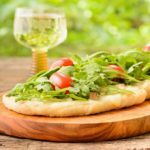 Top pizza with arugula and sliced tomatoes. Drizzle with olive oil and white wine vinegar (if using). Remaining sauce can be used as a pasta sauce. Chill leftovers and use within 3 days.